What a better way to welcome spring than with this juicy shade from butter LONDON. When I saw promo pics of the new butter LONDON collection I was immediately drawn to this color, it's perfect for spring and summer! It doesn't dissapoint. 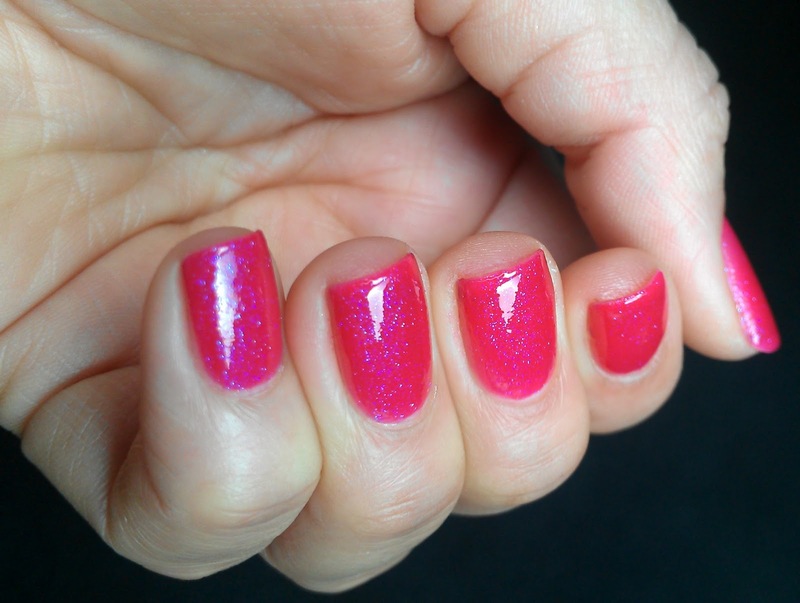 Bright Pink Jelly with irredesent blue glitter that shines thru like no other polish I have seen.. Formula is great, you need about 3-4 coats for full coverage, but I think that goes for all jellies. For this mani I used butter LONDON Nail Foundation Flawless Basecoat and Hardware P.D. Quick Topcoat which works great! Top coat does not dry as fast as Seche Vite, but its super shiny! The Basecoat is great my new favorite! *This prodoct was provided for review For more information, please see the disclosure page. That's sensational and such a disco pink. I want this one in my collection!! It's gorgeous! I start to regret, that I din't buy it, didn't realize back then, that it was a jelly. Would be great for jelly/glitter sandwiches too! It reminds me of one of my Kiko polishes. This is stunning, I absolutely love the blue glitter in the pink, such a unique combination. it is a great combination, I love it! I LOVE this polish, it's so girly and cute! I really love that color!! This is gorgeous!!!! I am definitely going to pick this one up! I want this one so badly!!! It's so gorgeous! Love it on you. OMG! That polish looks edible! Yum! I love the blue glitter. I just wish Butter London was cheaper. Lol! So squishy looking! Love it. Oh my word, this is stunning!!! i think this is the best picture I've seen of it thus far, I need it! I love this, it's gorgeous! So happy and fun. It's so girly & perfect for Spring! i looks amazeballs on you ! i love it :) and now i want it !! !